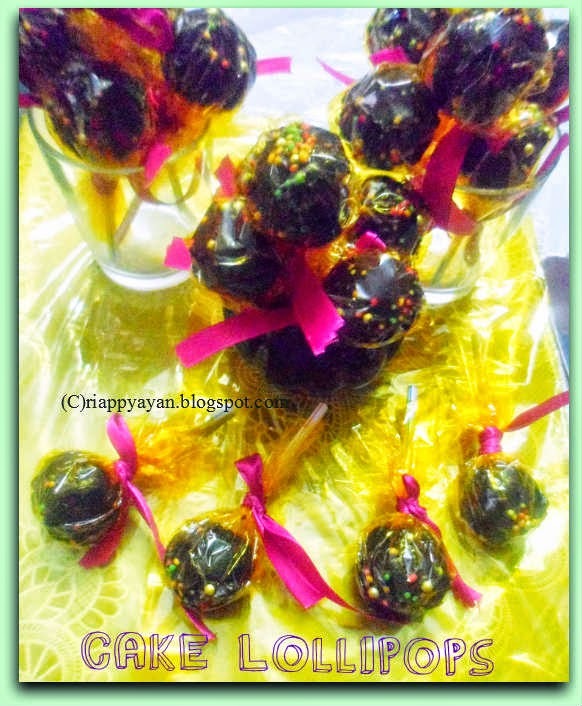 This cake lollipops are so hot favorite among children in birthday parties. These lollipops can bring smile to any kids' face. 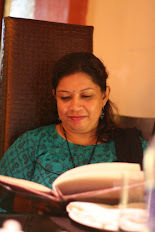 I tried them for first time on my son's birthday to treat them and their school friends. They are very easy to make. yes, its true, there are some specific method to make them, if you follow them, then they are not so tough. Off course, it takes some time when you're making them in bulk(like me), as I have made for 20 kids, 2 for each. I had even no time to click them properly for my blog. The kids on my kid's school were overjoyed seeing them and devoured them so happily, I just forgot all the pain. Actually, there are millions of varieties of cake pops recipe available, but I made the simplest one and the most tastiest one. 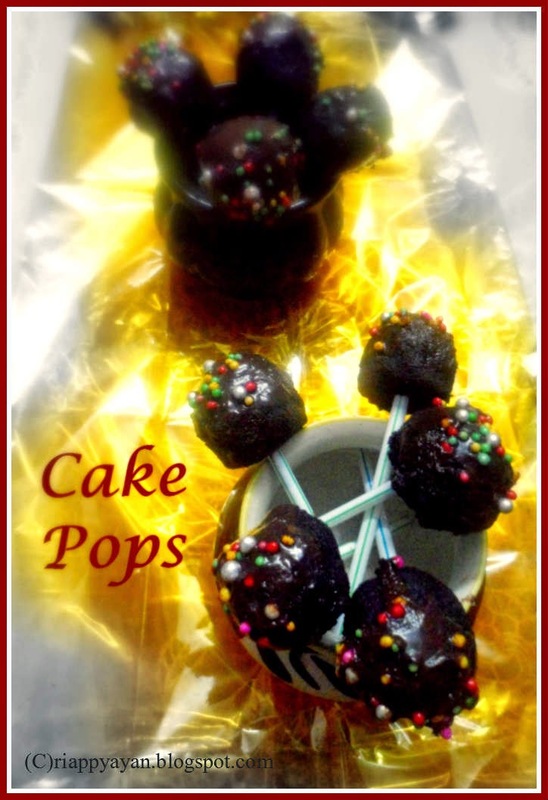 Chocolate cake balls dunked into decadent melted chocolate and picked into a stick, i.e., Cake pops/lollipops. Melted butter : 2 tblsp. Icing Sugar : 4-5 tblsp. 1. At first, we need to make a cake, it can be a cake of any flavour. 2. Then we have to crumble the whole cake or as much we need. Crumble the whole cake nicely without any lumps. Add melted butter and icing sugar or if you have any ready-made icing, add that now and again mix everything well. It will be a sticky dough, check if you can make small balls from the dough. if not, add some more icing sugar or ready-made icing. 3. Make as many round balls you need form the dough. Then Chill them in the refrigerator covered with a cling wrap for about 45 minutes to 1 hr. 4. While they are getting chilled, melt chocolate using double broiler. 5. Take them out of the refrigerator. Cake balls would be quite firm. Now it's time to cover them in chocolates and decorate them. It's the most trickiest part. 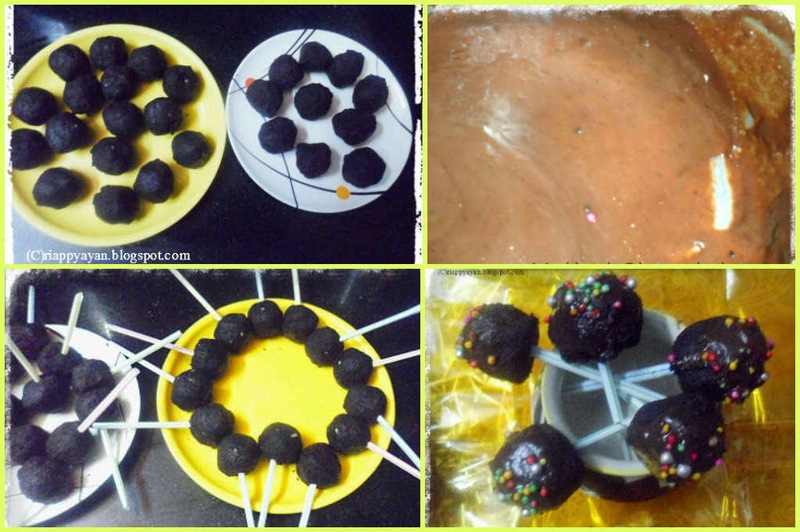 First, dip the straws in the melted chocolate and immediately insert them till half of the cake balls very carefully. Let them stand on a plate for 1/2 and hour to set(like pic. 9). 6. 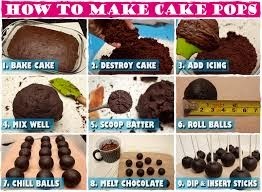 When the sticks are set, pick one pops at a time and dip the whole cake balls or just the tops as I did into the chocolate. Immediately sprinkle colored sprinklers or any decoratives you are using so that the sprinklers fixes on chocolate. 8. After the chocolate cover has set, I wrapped them individually and served the kids. Lovely looking cake lollipops. I too prepared some for my child's birthday this month.